Dhoni won the toss and invited the Sunrisers Hyderabad to bat first. Chennai looked good in their bowling and got their first wicket in the fourth over getting Alex Hales out. He was struggling and was playing at a score of 2 runs after 9 balls. Shikhar Dhawan, on the other hand, had a different script in his mind and he seemed determined to write it. Batting fearlessly, Dhawan charged on the CSK bowling attack and accompanied by the skipper Kane Williamson on the other side. Dhawan hit the ball hard and amassed 79 runs playing just 49 balls and continued with his great form. Kane Williamson also made his bat do the talking as he added 51 runs playing 39 balls. However, no other player from the SRH could make any substantial contribution to the scoreboard. SRH put a target of 179 runs for the CSK to chase. The things started the perfect way for the superkings as both of their openers Shane Watson and Ambati Rayudu were enjoying the Hyderabad bowlers. Shane Watson looked well with his bat and he added 57 runs off 35 balls before he got run out. 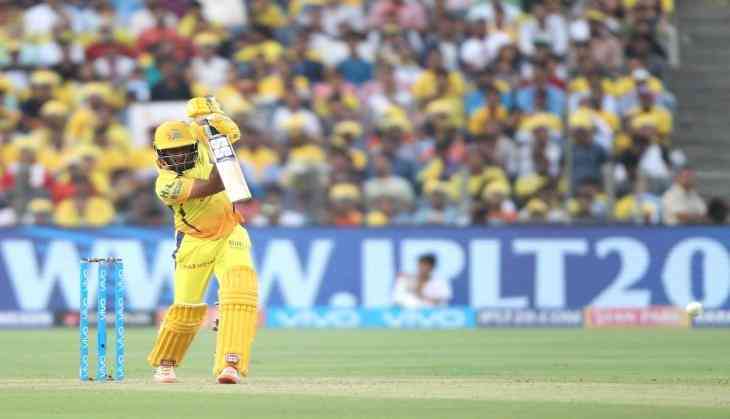 Ambati Rayudu, on the other hand, had a one-man show but the momentum of CSK's batting was halted after Raina went down for just 2 runs. Dhoni was dropped by Manish Pandey in a more than simple catch. CSK got closer and closer to the target as the man of the moment Rayudu hit his maiden century off 62 balls.